RoyalEnfields.com: Is the SYM Classic a replica Royal Enfield? Is the SYM Classic a replica Royal Enfield? Riders of Royal Enfield motorcycles are used to getting questions shouted at them by other motorists at stoplights. One of the most frequently heard is "Hey! Is that a replica?" A replica? No, a Royal Enfield is not a replica, although it is true to the appearance (and to some extent the mechanics) of a motorcycle of a previous age. A motorcycle that has been in continuous production can not be a replica of itself. Can it? The trouble comes when the guy at the stoplight inevitably asks the NEXT question: "What year is it?" Here's the dilemma: If I answer "1999" I leave him confused. How can something that looks so old be so new and yet NOT be a replica? At a stoplight, there is no time for long-winded explanations. I could answer "1955," since there isn't much difference between my Royal Enfield Bullet and the 1955 model. But that would be a lie, and it invariably causes the guy to yell "Great job with the restoration!" Of course, there was no restoration; I likely haven't even washed it this year. Eventually the light changes and the problem goes away. But it all comes to mind when considering the SYM Classic 150 the SYM company of Taiwan will introduce to the U.S. in 2010. It is a retro-styled motorcycle and, in one catalog illustration, it looks an awfully lot like a Royal Enfield Bullet. The picture shows the SYM Classic 150 with pedestrian slicer, solo seat and pillion pad, options often adopted on Royal Enfield Bullets. While these are old fashioned accessories (most Bullets come with a stock dual seat) the Royal Enfield has earned the right to wear them; it is, by heritage, a British motorcycle, although built in India since 1955. 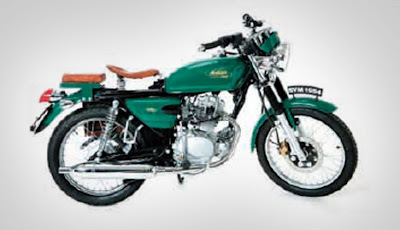 Is the SYM Classic 150 a replica Royal Enfield? SYM already builds scooters that evoke memories of classic Hondas and Vespas. Why not a tribute to the great British style motorcycles of the past? And at half the price? It's just not the same thing, anymore than if SYM built a 150cc motorcycle styled like a big Harley-Davidson. There are elements of scale that it can not duplicate. The engine's sound is far different, as the 150cc relies on high rpm to move it along. The riding experience will be different. Fun comes in many sizes and fashions, of course. But if I were buying a SYM Classic 150, I would choose the model that looks more like a small Japanese motorcycle, of the 1970s, which is where its heritage begins. That way, no one would ask whether it's a replica, because it truly does look like the real thing. And, oh, by the way, "Nice job on the restoration!" I think the SYM red and white standard bike looks great. Reminds me of the old Honda 125's. No thanks on the green one. They may be similar to a Royal Enfield but that is about it. The RE has its own certain appeal. But no one has tried to go for the British look. I would have to see it in person. Slapping a couple of springer seats and a pedestrian slicer on an otherwise generic lightweight modern bike runs a high risk of looking cheesy.